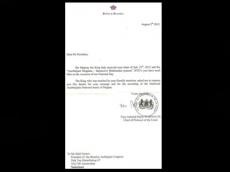 Belgian Vice-Admiral Pierre Warnauts, Head of Protocol at the Royal Palace in Brussels has sent a letter of gratitude to the Amsterdam-based Benelux Azerbaijanis Congress (BAC). King Albert thanked BAC for sending a letter of congratulation to his address on the occasion of the National Day of Belgium. The letter also says that the album “Azerbaijani mugam” presented to the Majesty by the BAC gave an opportunity to him to get closer acquaintance with the history of mugam which is the inseparable part of the Azerbaijani rich national music.